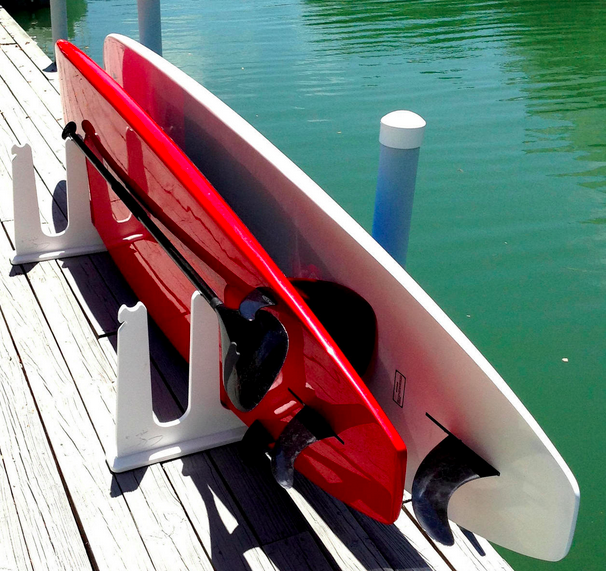 There are a number of reasons why you might be looking for a freestanding rack to store your SUPs and paddleboards. Freestanding racks offer versatility in that they are portable, so you can take them all the different places you store your paddleboards. Also, they don't require any installation and so won't require damage to your walls or your house, which is great for renters and good in general too. We offer a few different options on freestanding SUP racks, which are mentioned below. Of course, we have others on our site, which can be sorted and searched for freestanding racks only! SUP Rack for Docks and Piers: this paddleboard rack has been a huge hit with customers because so many of them want to store their paddleboards right where they want to use them, at the waterside. This is great because SUPs can be huge and so tough to lug around, so having a rack at the waterside saves you a bunch of trouble in transport. 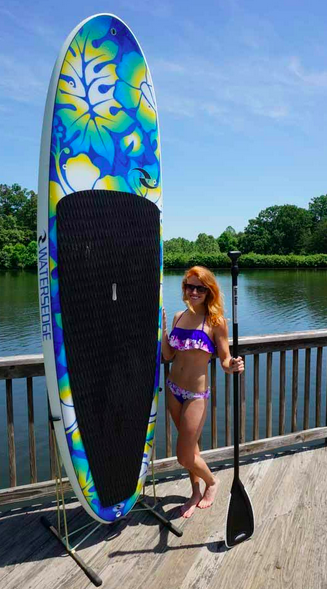 This SUP rack comes made for either 1, 2 or 3 paddleboards, so customize it for your dock side area! Also, consider a SUP lock so you can lock up your SUPs in the rack and not have to worry about them getting stolen. Triple SUP Freestanding Rack: here's another freestanding SUP rack that offers multiple board storage but this one is geared more for economical storage for spaces like garages, repair shops, retail stores, under your deck, and more. This rack needs no mounting equipment and its arms can be removed by using a simple push pin. With that, the rack is still very sturdy and can support up to 150 pounds of your SUPs, so 50 pounds per 3 paddleboards. 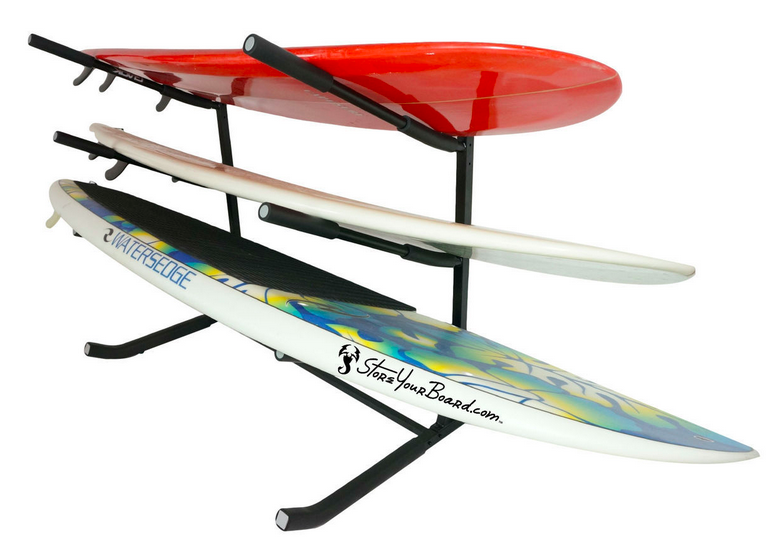 For those with a large quiver of SUPs, this rack also comes in a 5 paddleboard rack version! Freestanding SUP Display Rack: the final freestanding SUP rack we're going to feature is another really popular rack that allows you to really show off everything your paddleboard is about. This SUP display rack holds your paddleboard vertically using a 3 steel point contact system that is akin to being spring loaded. When the tail of your SUP contacts the rack, the side arms engage to hold the paddleboard firmly. Yet the rack still is able to accommodate boards of all different shapes. This SUP rack is great for displaying SUPs in retail stores, at trade shows, or even in your home, if you have tall enough ceilings!